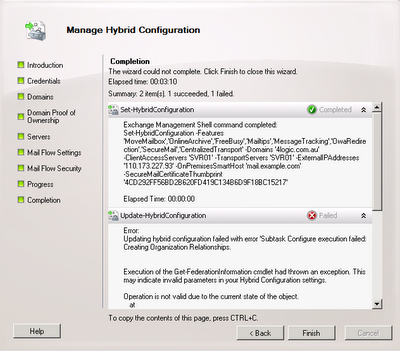 Federation Information could not be received ..
Updating hybrid configuration failed with error ‘Subtask Configure execution failed: Creating Organization Relationships. Execution of the Get-FederationInformation cmdlet had thrown an exception. This may indicate invalid parameters in your Hybrid Configuration settings. The problem lies in the sentence “Federation Information could not be received from external organization”. To see where it goes wrong, you could run Set-HybridConfiguration and Update-HybridConfiguration manually, using additional parameters as shown in the result screen, providing proper credentials and additionally addint the Verbose parameter to increase output logged. The first issue often overlooked is internal autodiscover not working via DNS or not being set up properly, i.e. split DNS configurations. Some customers don’t configure internal DNS autodiscover records or don’t allow (internal) autodiscover to go through the proxy from inside. Normally, when using regular clients like Outlook, this isn’t an issue because domain joined clients will be using SCP records from AD. However, federation will use DNS records so you need allow it or set it up in DNS; a CNAME for autodiscover.example.com as well as autodiscover.service.example.com pointing to your hybrid server will suffice. In the error message you’ll notice a autodiscover-related request going to /autodiscover/autodiscover.svc. These requests are normally caught by the autodiscover rule (path /autodiscover/*) in ISA or TMG. Issue is, these service requests require unauthenticated traffic. When you turn on logging in TMG, you’ll notice the requests for /autodiscover/autodiscover.svc will be denied. After configuring the rule, you need to put it above all the other Exchange rules, making it the first matching rule when federation traffic hits ISA/TMG. After applying the rule changes, Get-FederationInfo example.com should work and you can continue with the Hybrid Configuration. For more information on setting up co-existence, consult the steps provided by the Exchange Deployment Assistent. This entry was posted in Exchange 2010, Office 365 and tagged Exchange2010, ExchangeOnline, Hybrid, Office365, Setup by Michel de Rooij. Bookmark the permalink. When I try to create a TMG rule for autodiscover, and set the authentication to ‘no authentication’, the entry can’t be saved… it states ‘The authentication settings of the Web listener used in the rule Redirect OWA are not compatible with the type of credentials delegation configured for this rule.’ any ideas on that? Nevermind, I believe I’ve resolved this. or not.. might need a different listener? The rule authentication delegation setting need to be in the same authentication scheme as the authentication setting on the listener (and the CAS server(s)). Autodiscover needs to be authenticated. You could use the Outlook Anywhere publishing wizard to set the initial rule up for you using the autodiscover FQDN (will add autodiscover configuration), and remove the Outlook Anywhere specifics from the Paths, i.e. /rpc/* and /oab/*. Thanks a lot, appreciate this post, came to my rescue at the right time. Thanks for this post, I think that has given me a light. But when performing continuous DNS entry error, however I think it is something else because when I run the cmdlet: “Get-FederationInformation mydomain-Verbose” now gives me an error of SSL / TLS before I appeared. VERBOSE: [17:22:16.348 GMT] Get-FederationInformation : Resolved current organization: . VERBOSE: [17:22:16.353 GMT] Get-FederationInformation : Using the following trusted host names: *.outlook.com. I wonder if the fact that the certificate is not aparesca “autodircover.mydomain” has to do with this failure. This saved the day for me!! Great post. Thank you! !